If you have any other questions please do get in touch. We will be happy to try to answers your queries. Is this the kind of dance where I need to bring a partner? Do I need any special shoes or clothing? Is there a lot of form-filling? Is it anything like ceilidh dancing? Is it anything like line-dancing? What is the difference between an English ceilidh and a barndance? Where can I get a band for my barndance or ceilidh? Is it anything like Sequence Dancing? Do I have to join the EFDSS? Q. Is this the kind of dance where I need to bring a partner? A. NO! Of course you can if you want to, but don't let the lack of a partner stop you from coming to the dance. It's also perfectly in keeping for Ladies to dance together. Come to the dance on your own, come in a group, come with a partner -- just come and have fun! Q. Do I need any special shoes or clothing? A. No! Just a pair of shoes you feel comfy in, and your own choice of clothing. You would look out of place in check shirts, straw hats, and cowboy boots! Come as you are. Q. What age do you have to be? A. Any age, really. Children from junior school age can cope very well, and people of every age can enjoy it until well into old age. And people of all ages can dance it together. Q. Is it anything like ceilidh dancing? A. Yes, but with some important differences. In Scottish and Irish Ceilidhs, there are about half a dozen dances that "we all know from school". Country dancing can choose from many hundreds of different dances, so a bit more thinking and learning is needed! Q. Is it anything like line-dancing? A. Only in one sense; most of the dances are a set of movements which are repeated. The main difference is that you do not dance by yourself, doing exactly the same as the others, but you play different parts in teams or sets or groups. Q. Is there a lot of form-filling? A. No! Just pay a small weekly charge on the evenings you come along. Some clubs would like some contact information, just in case there is some problem, like the hall being suddenly unavailable. It can happen. Q. What is the difference between an English ceilidh and a barndance? A.Not much. They are both easy-going dances very suitable for beginners. If anything, the ceilidh is a bit more rumbustious and the barn dance a bit more sedate. Q. Where can I get a band for my barndance or ceilidh? A. Start by following this link. to our Newsletter page, then click for Bands And Callers (you will need both). Q. Is it anything like Sequence Dancing? A. In one sense, it is. Most English dances feature a series of linked movements or steps, which are repeated a number of times - a sequence. The main difference is that the dancing is not done in Couples, but in larger groups, often with each couple in the group in turn leading the sequence. Q. Do I have to join the EFDSS? A. No. 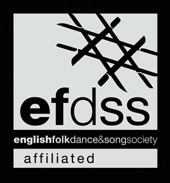 The EFDSS (English Folk Dance & Song Society) is the parent body for all English country dancing, and the local clubs are affiliated to it. Many local dancers are members of EFDSS, and all dancers are encourage and invited to join, but it is not compulsory or essential.